Plenty of people out there are currently creating concepts and theoretical wish lists for what features they are hoping to see on Samsung’s 2014 flagship device, the Galaxy S5. With Samsung openly talking about 64-bit Octa processors and even curved 4K displays, it definitely has us a bit excited for what is in store for the future of mobile. 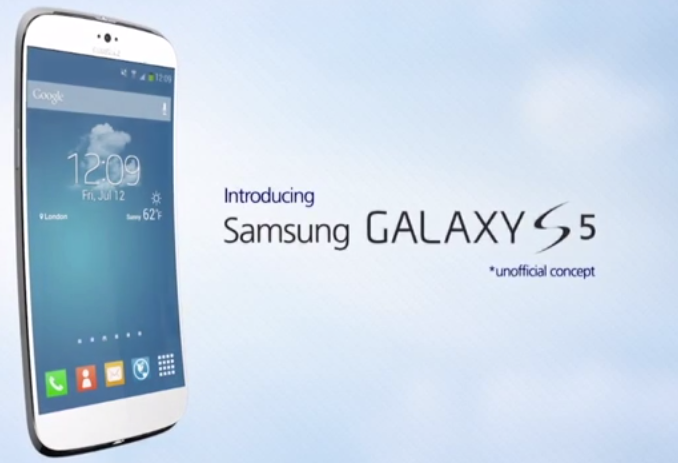 Posted on their YouTube channel, O2GuruTV released their idea of what they would like to see from the Galaxy S5. To say that this concept looks like an absolute dream device is a bit of an understatement. The phone they detail features a futuristic 64-bit Octa-core processor, 3GB of RAM, a 16MP shooter, 4,000mAh battery, a curved 2K HD 2560 x 1440 display, a less-intrusive version of TouchWiz running atop Android 4.4, and other miscellaneous top tier specs. If we come back down to reality for a moment though, we would have to say that while this device looks quite special, there are a few things we can probably check off as not being a part of the upcoming GS5. While the 64-bit processor and 3GB of RAM sound about right, and even the 16MP shooter could be onboard, Samsung throwing in a curved 2K HD display seems more like a “down the road” feature. While we don’t doubt that they are eventually coming to the mainstream, we still think that this feature would be more probable in 2015 or even 2016. Of course, we don’t exactly know what Samsung has in store, but we’d be more than happy to have this phone sit happily in our pockets. What about you? Let’s hear your wish list for next year’s Galaxy S5 – does it look like this?